Soak beans overnight. Drain water, rinse, and replace with 3 cups of fresh cold water for cooking. Place on stove and bring to a boil (for at least 10 minutes) in a pot with a lid. Once boiling, reduce to a simmer, tilting lid slightly to allow steam to escape, and leave to cook for up to 90 minutes, or until tender. At the same time, bring 1 cup of quinoa and 2 cups of vegetable broth to a boil. Cover and simmer for 20 – 25 min. until the quinoa tail is visible, and the water is absorbed. Let sit covered for 5 minutes and fluff with fork. Makes 2 ½ cups. Add drained kidney beans and quinoa to a large bowl. Mix in chives, miso, spinach. 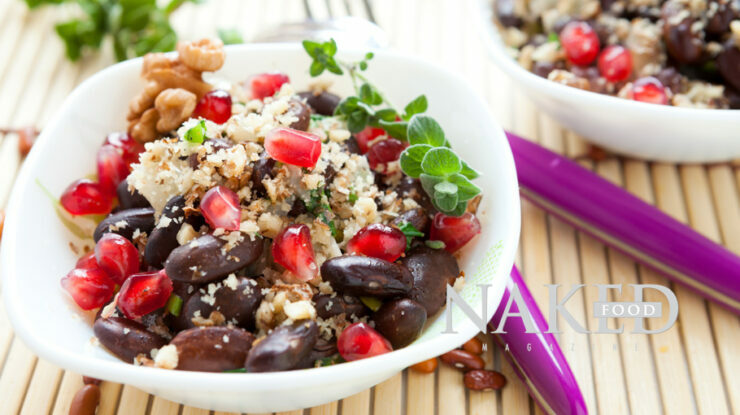 Serve and sprinkle walnuts and pomegranates on top. Another recipe to be served on our table! Thanks for sharing your idea. I never thought that adding pomegranate seeds in your recipe would be healthy and delicious. This would be my first to try this out, I hope that it will be mouth-watering like yours. What I liked about this recipe was, it’s not only delicious, it brings or produces also health benefits. For months now, I’ve been serving only healthy foods because of cardiovascular disorder aside from this I am taking also a resveratrol that is belong to a family of plant compounds called polyphenol and this pomegranate is rich in resveratrol which is really good to serve to my family. Anticipating for your next recipe.